Things have been really exciting since your daughter announced her engagement to her long-time companion. After months of searching for the perfect venue, she’s settled on the setting from her childhood dreams – your backyard in Sydney. While you’re flattered and happy to accommodate, you don’t have the equipment needed to host 100+ guests. Put all your worries to bed by hiring all your wedding reception equipment from Outwest Party Hire. From tables and chairs to dance floors and wedding marquees we have everything you need to make her special day everything she’s always dreamed about. While your property is undoubtedly beautiful, shade is needed to make the day comfortable. Wedding marrquee hire available in Sydney provides essential sun protection for guests making your setting hospitable even at the hottest part of summer. Located in Penrith, we offer free-standing and peg and hole marquee hire delivered and erected by skilled professionals to the surrounding region. Don’t trust your guest list to amateurs. Improper installation risks your guests’ safety and a collapse ruins the whole party. Alternatively, successful marquee hire set up by our Penrith team can be used to cover the dining area, to provide shade for the dance floor, or even protect the entire event from rainy weather. We have marquee hire from Penrith in various styles and sizes to suit your specific needs and space constraints. A hired wedding marquee can have windows, open on one side, or serve as a fully-enclosed temporary room on your Sydney backyard. With everyone crowding to the dance floor to take part in the wedding festivities, a more open and free-flowing arrangement is ideal. Penrith’s marquee hire also has options without side walls. We know that weddings get stressful. Let us help you by providing you with one streamlined source for all your wedding hire needs. She’ll have choice between style of chairs, tables, and even linens matched beautifully to accent the occasion. Evening receptions are no problem with our stock of heaters and lighting. We’ve thought of everything from rubbish bins to artificial grass so that you don’t have to. We have a reputation for friendly, punctual, customer-centred service backed up by quality equipment and affordable rates. Our Penrith marquee hire team doesn’t cut corners. With your guests’ safety in mind, we make sure the equipment is in proper shaper and installed correctly before leaving the delivery point. We have the inventory to accommodate spaces large and small with the experience to help you maximize space for the number of guests you’re hosting. The bride will be focused on style and ensuring that everything look just so. It’s our job to understand our equipment and how it can be used to best serve our clients. We’ll lend our knowledgeable opinion about the marquee hire that’s right for this momentous occasion. 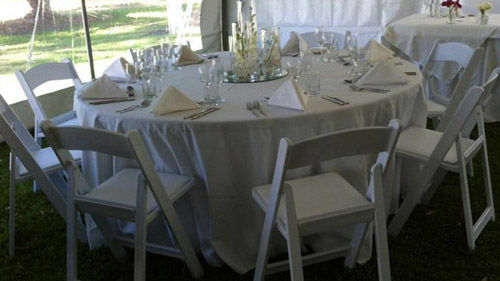 Take the headache out of turning your backyard into a wedding venue with Outwest Party Hire.